Recent assaults on the reputation of Women’s March cochair and prominent black American activist Tamika Mallory demonstrate, yet again, that speaking even the most basic truths about Israel and Palestine is a hazardous undertaking. Last June, Mallory was disinvited from a conference in Australia for public comments observing that the creation of the state of Israel entailed a “human rights crime” – a statement that should hardly have been considered radical, let alone grounds for a disinvitation, given that the ethnic cleansing of Palestine that accompanied Israel’s founding has been well-documented, including by Israeli historians. Mallory’s position is an accurate reflection of international law: no state has an inherent right to come into existence, and certainly not any right to commit the crimes involved in Israel’s ongoing “disposal” of the Palestinians, copiously recorded by Palestinian, Israeli, and international human rights organisations. Hoover’s rejoinder to Mallory, “I just don’t think it requires scholarly knowledge to be able to say that Israel has a right to exist,” was thus unwittingly insightful; when it comes to the prevailing discourse on Israel’s supposed entitlements, “scholarly knowledge” of relevant disciplines like international law appears not to be required, and, indeed, is actively disregarded. Journalists like Hoover fixate on the fabricated rights of Israel, while the actual rights of Palestinians enshrined in international covenants, such as the right to self-determination, the rights to be free from discrimination and collective punishment, and the right of return for refugees, are completely erased from the picture. Clearly, what is being demanded of activists like Mallory is not an affirmation of Israeli people’s rights, but a denial that Palestinians have any rights at all. The treatment of Mallory is alarming not because it is exceptional, but because it is not. Between 2014 and 2018, American NGO Palestine Legal responded to more than 1,200 incidents involving attacks on the expression of solidarity with Palestine – baseless lawsuits, censorship, violence, threats of violence, firings, and false accusations of anti-Semitism and terrorism. Over the past few years, laws against the Boycott, Divestment, and Sanctions (BDS) campaign, which aims to pressure Israel to comply with international law, have now been enacted in 26 US states. Targets of punishment for Palestine solidarity in the US in the last few months alone have included scholar-activist Marc Lamont Hill, whose speech at the UN in support of justice and freedom for Palestinians got him fired from his post as a commentator on CNN – an outlet that habitually features a preponderance of Israeli government and advocacy perspectives while marginalising Palestinian ones. And Angela Davis, whose Fred Shuttlesworth Human Rights Award from the Birmingham Civil Rights Institute was rescinded because of her activism for the fundamental human and civil rights of the Palestinians – a decision only reversed after it generated widespread public outcry. And Congresswoman Rashida Tlaib, accused of appealing to anti-Semitic tropes of “dual loyalty” in her opposition to a federal anti-BDS bill – never mind that none of the politicians criticised by Tlaib for introducing the bill are actually Jewish, and that some of the organisations impugning her have themselves invoked similar tropes to demonise Muslim Americans as enemies within. Similarly blatant double standards pervade the continuing barrage of condemnations against Tamika Mallory and her sister cochair of the Women’s March, Muslim Palestinian American activist Linda Sarsour. Among those who have chastised the Women’s March chairs for fraternising with Farrakhan is Meghan McCain – whose father, the late Senator John McCain, insisted on referring to Vietnamese people as g**ks, sang gleefully about bombing Iran, and enthusiastically supported an illegal war of aggression that killed approximately half a million people in Iraq. On a recent episode of television talk-show, The View, featuring Mallory as a guest, host McCain abandoned all semblance of self-awareness to sanctimoniously proclaim she “would never be comfortable supporting someone” who engaged in Farrakhan’s hateful rhetoric – having managed to quite comfortably panegyrise her own father as a “great man” who was “defined by love”. Comparable levels of hypocrisy characterised the statement issued by Congresswoman Debbie Wasserman Schultz, former chair of the Democratic National Committee, explaining her refusal to participate in the Women’s March this year. “I cannot walk shoulder to shoulder with leaders who lock arms with outspoken peddlers of hate,” Wasserman Shultz announced – but apparently has no problem rubbing those same shoulders with leaders like Israeli Prime Minister Benjamin Netanyahu, whose government has not only indulged in the outspoken peddling of hate against Palestinians but institutionalised this racism in law. 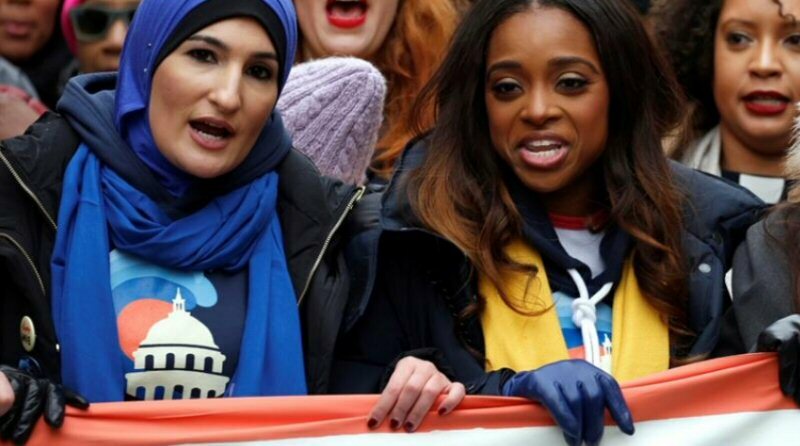 While the Women’s March leadership has issued repeated apologies and repudiations of Farrakhan’s anti-Semitism from the margins of American society, the racial violence emanating from the centres of power with their detractors’ complicity continues apace, attracting minimal scrutiny and opprobrium. The conceit that Palestine is not a feminist issue is sustained by perpetual erasure of the Palestinian women who, in the words of Amnesty International, “carry the burden” of Israel’s American-sponsored occupation and militarism: the women whose homes have been destroyed and family members arbitrarily imprisoned or killed, the women forced to suffer the indignities of being violated by soldiers and giving birth at checkpoints, the women harassed, abused, or killed for protesting the unliveable conditions under which they are made to exist. It is revealing that opinion pieces expressing “worry that my support for Israel will bar me from the feminist movement”, as journalist Emily Shire complained in the New York Times, themselves exclude all mention of the violence experienced by Palestinian women. Shire, for instance, castigated the Women’s March for having an action endorsed by Palestinian activist Rasmea Odeh, described as “convicted for her involvement in a 1969 bombing of a Jerusalem supermarket that killed two Hebrew University students and an attempted bombing of the British consulate”, but omitted the fact that Odeh’s confession was extracted by prolonged sexual, physical, and psychological torture: a detail one would expect to be a primary focus of feminist concern. It is revealing also that the same media outlets bemoaning the anti-Semitism imputed to the Women’s March have extolled as a feminist victory the ascent of women to the pinnacles of the American military-industrial complex. The women (and men) on the receiving end of weapons systems produced by female-headed corporations like Lockheed Martin and General Dynamics, including in Palestine, are ignored as mere “collateral damage”. This tradition survives despite persistent state efforts to suppress and punish it, because justice for “just us” is no justice at all.